On January 8th, 2018 Tulsa Police Officers were contacted in reference to a suspicious vehicle at a business in the area of 10900 E 31st St. Once officers arrived it was determined that the vehicle was reported stolen on January 3rd, 2018. After reviewing the video surveillance, officers observed a series of events that led to the vehicle being left on the property. 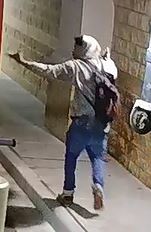 The person(s) of interest are both described as black males in their teens or early 20’s. One individual was last seen wearing blue jeans, white hoodie, and black backpack with red emblem on the back. The other individual was last seen wearing a green hooded sweatshirt and blue jeans.